When being asked to do an album review of an artist about which you have heard little, it is hard to know what to expect. However, I am pleased to say that with his self-titled debut album, JT Hodges has well exceeded any expectations that I had in mind. As I started listening to the album, I found that the flexibility and ease of his voice captivated, drawing me in to listen to what he had to say. The album starts off with a catchy number, “Rather Be Wrong Than Lonely” which features upbeat, powerful drums and strong guitar chords. “Sleepy Little Town” tells the traditional story of secrets kept in a small town. The mid-tempo song took me by surprise with its unique spin of the story we have all heard. Do not be surprised if it is one of your favorites by the time it is over. “Hunt You Down” is a whistlin’ tune telling a far-fetched love story. It was not until about halfway through the song that I realized why the line “Look you up, I said. Hell I’m gonna hunt you down” sounded so familiar—I had heard it before. The song had been released to the radio in 2011 as Hodge’s first single. It is one of the best on the album and will have you singing along in no time. “Give It One More Night” is a toe-tapping number, which exemplifies the magnitude of Hodge’s voice. The slow, touching piano ballad “When I Stop Crying” shows a different side of JT Hodges’s music, telling the tale of lost love. The steel guitar adds the perfect touch. This next track might be my favorite one on the album. The singer’s second single, “Goodbyes Made You Mine” is an upbeat tune that would make any country girl’s heart melt. With this catchy number, Hodges compares himself to all those other men out there that have done girls wrong, giving every girl a reason to fall for him, enthralled with his charm. “Leaving Me Later” is that traditional song about the girl you cannot tie down. Its lyrics are a lot like songs you have heard in the past. Nonetheless it is a song you cannot seem to skip over. I really enjoyed “Right About Now”, a mid-tempo song telling the story of an ex-lover who cannot seem to shake thoughts of a lost love. Although the amazing instrumentals of the band are exemplified in every song, they take a high note in “Rhythm of the Radio”. The album wraps up with “Green Eyes Red Sunglasses” which is somewhat southern rock-infused. It has a surprising appeal the more you listen to it. 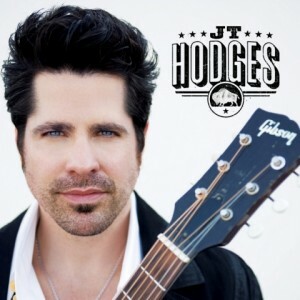 JT Hodges overall has an amazing debut album. His captivating lyrics will have you on the edge of your seat and coming back for more. The instrumentals vary from song to song, allowing for an amazingly unique sound to each one, along with the help of his powerful voice. I look forward to more from him. “JT Hodges” comes out August 21. ← Country Thunder 2012 Sold Out!